Notice: Undefined index: und in kmb_preprocess_page() (line 170 of C:\Program Files (x86)\Apache Software Foundation\Apache2.2\htdocs\pcec_new\sites\kmbtoolkit\sites\all\themes\kmb\template.php). Warning: Invalid argument supplied for foreach() in kmb_preprocess_page() (line 171 of C:\Program Files (x86)\Apache Software Foundation\Apache2.2\htdocs\pcec_new\sites\kmbtoolkit\sites\all\themes\kmb\template.php). 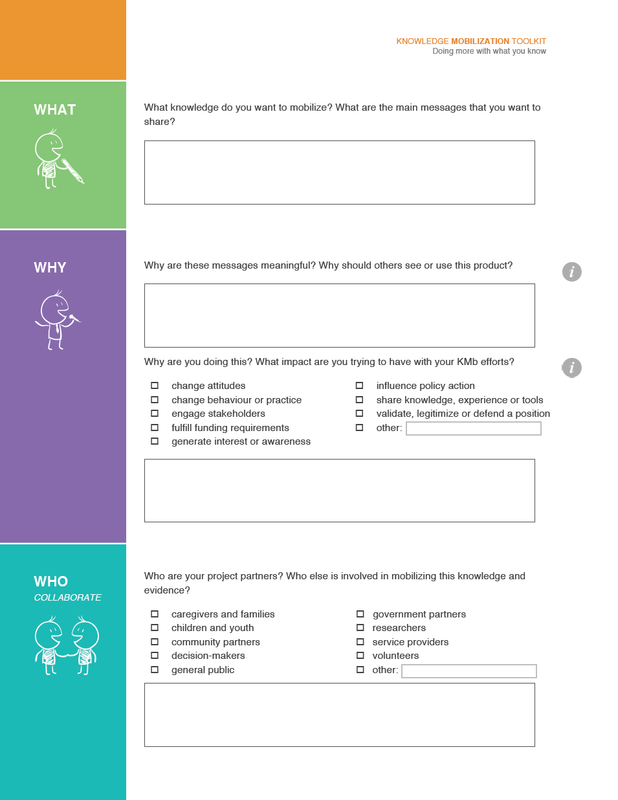 Looking for more information to help you evaluate your knowledge mobilization (KMb) efforts? The Program evaluation toolkit contains tools and templates for planning, doing and using evaluation, including a template and support for developing a logic model. There is a growing list of learning modules and webinars offered on evaluation topics, including this webinar that presents current frameworks and strategies that link evaluation to organizational learning. The Project showcase contains information about each of the projects the Centre has funded to date, including planning and doing evaluation grants. The Measures Database is a growing online directory that profiles measures related to child and youth mental health and program evaluation. The Centre also offers consultation, coaching and support in program evaluation. Contact us to learn more! The Innoweave Developmental Evaluation self-assessment tool can help you determine your community’s readiness and capacity to use a developmental evaluation approach. The Community Tool Box provides resources and tools to help people work together to build healthier communities, including information on evaluating community programs and initiatives. The National Collaborating Centre for Methods and Tools provides a registry of resources relevant to using and doing knowledge translation in public health, including some relevant to evaluation. Effective Knowledge Transfer & Exchange for Nonprofit Organizations: A Framework (developed by Imagine Canada) provides questions for identifying potential outcomes of various KTE activities. It also provides examples of evaluation tools. Knowledge Translation: A synopsis of the literature (developed by Alberta Health Services) provides some information on measures related to knowledge translation. Knowledge Translation: Introduction to Models, Strategies, and Measures (developed by the University of Wisconsin-Madison) provides approaches to measuring knowledge use. A Guide to Monitoring and Evaluating Health Information Products and Services developed by the United States Agency of International Development provides indicators for measuring reach, usefulness, use and collaboration and capacity building. The Good Indicators Guide: Understanding how to use and choose indicators is a practical resource for using indicators to monitor and improve performance, systems or outcomes. Ready to get started? Download the knowledge mobilization plan here! TIP: Be sure to save the form to your desktop and open it in Adobe Reader so you don't lose your work.